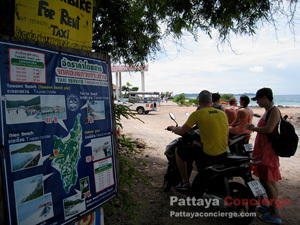 There are Song thaews (Song Taews), and motorcycle taxis available on the island, so visitors can go to anywhere they want. 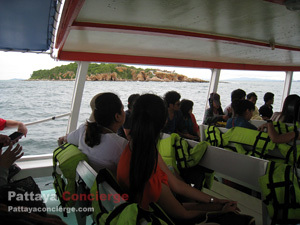 The price of them will depend on how far visitors go, approximately 20 – 50 Baht. This would be an interesting choice for visitors who do not plan to see around a number of places on this island because it will cost them less. However, those who would like to enjoy freedom and more comfortable can hire a motorcycle, which can be hired at any motorcycle terminals, or at resorts visitors stay. It will cost about 250-300 Baht / Day, so if owner of motorcycle rental ask for 400 - 500 Baht, just deny the offer and look for the others. There are either automatic or manual motorcycles for you to choose, and they will come will full of petrol as well. There is a car park at Pattaya Port, Bali Hai, but it is not much space, so if visitors go there a bit late, they might not be able to park their vehicle here. However, there are also two parking areas near the port. 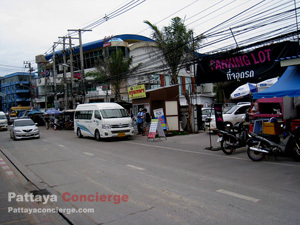 One is near the blue building next to Pattaya Walking Street (see Blue Building Car Park). This vehicle parking is cost you a little but seems to be more secure.,40 Baht / day / car and 80 Baht / over night / car. The other parking area is on the righthand of MiXX Club, but this one higher price though (see The Alternative Car Park). For motorcycle, it will cost you about a half price of parking a car. Those who have a private vehicle just drive the vehicle on Sukhumvit Road, and turn right to South Pattaya. Then, turn left at the first traffic light, and just go straight on though a bridge to be Bali Hai.